We can hardly wait to pick up the new 2011 Ford Explorer for our week long roadtest review next week! I plan on giving this vehicle the true 'MommyO' test (that means, this review won't be about why DaddyO likes or dislikes the Explorer). It's all about me! Mowahahahaha! If this vehicle is one of interest to you, please feel free to post any questions you may have in the comments section of this post. I'll do my best to answer your queries. 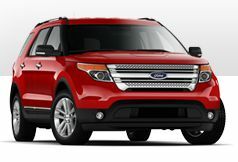 The New 2011 Ford Explorer has so many great and exciting features, it is creating quite the buzz! Check out the "MyFord Touch" feature, in this video clip with Brett Michaels. We haven't driven a Ford lately, but certainly do look forward to our chance to. Get to a dealership near you to check out why this NEW Explorer is being talked about! I'm wondering how easy it is to clean up? Like if you pass a few cherrio's back to the kids and drop half of them while you're passing them from the front seat to the back seat, can they be hand picked out between the arm rest and seat that separates the two captain chairs in the front? Can the kids the 4 and under crowd climb into and out of the vehicle all by themselves with little to no danger of falling? What about mom buckling the kids in once they climb into the vehicle? Could a 5 foot tall mother buckle them in without climbing up on the step rail or would mom need to climb into the vehicle to buckle the kids in? What about a wheelchair? Would a wheelchair fit in the back? A wheelchair for a 4 year old. Wheelchair has extended leg rests and fully reclines and an extension bar for pushing. I may have just a little old blog Mr Ford People but I want to drive this mean machine for a few years, if you'd let me. I've been thinking about a Ford Edge but need a job first!! I love the Bret Michaels video too funny! I can't wait to hear what you think! You know, my questions would be the same as all vehicles. Can you fit 3 car seats side by side without having to by a special brand? Or, how about 2 car seats and a booster seat where it is still easy to buckle in? Are the latches for the seat buckles supported so that when I go to buckle the booster in, it doesn't get lost between the seats. How much leg room for the kids so I don't get kicked, and if there isn't much, do the back of the driver and passenger seats at least have a material on it that is easy to clean? You know I love my Ford! Come visit again sometime soon.